Dietary proteins, including those obtained from animal and plant sources, have inconsistently been correlated with type 2 diabetes mellitus (T2DM) risk. Therefore, a meta-analysis was conducted to evaluate the association between dietary proteins and the risk of T2DM. Prospective cohort studies published until November 2018 were systematically searched in PubMed, Embase, and the Cochrane library. 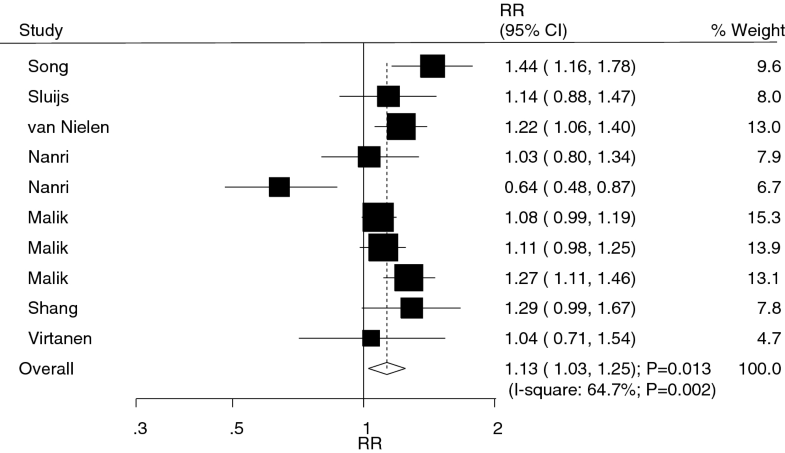 The pooled relative risks (RRs) were calculated with 95% confidence intervals (CIs) using the random-effects model. 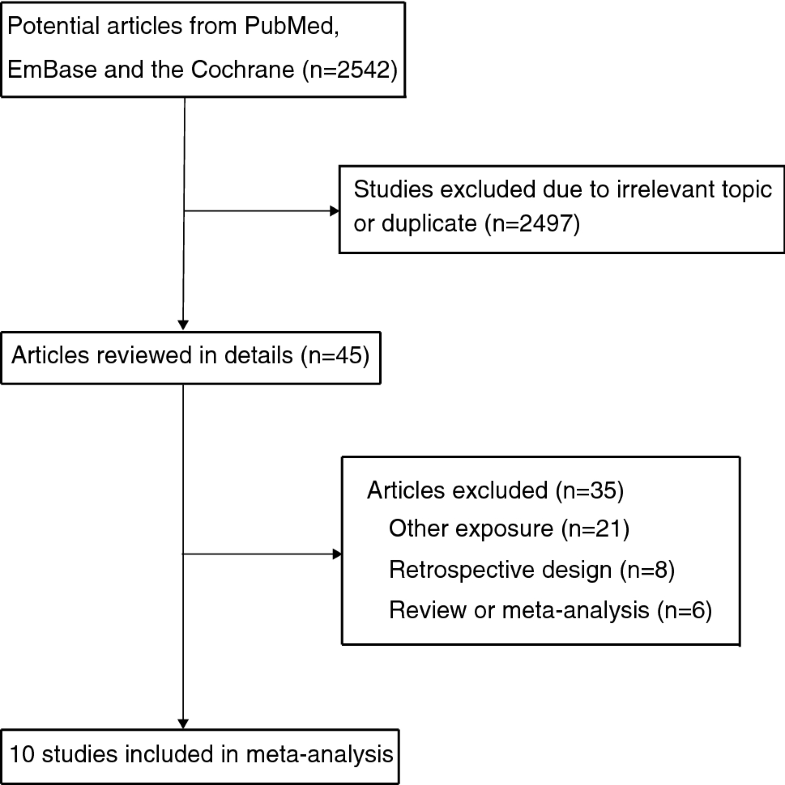 Ten articles involving a total of 21 cohorts were included in the final meta-analysis. A total of 487,956 individuals were recruited in these studies and 38,350 T2DM cases were reported. Analysis of the pooled RRs indicated that high total protein intake was associated with an increased risk of T2DM (RR 1.10; P = 0.006), whereas moderate total protein intake was not significantly associated with T2DM risk (RR 1.00; P = 0.917). Moreover, a higher risk of T2DM was observed with high animal protein intake (RR 1.13; P = 0.013), whereas moderate animal protein intake had little or no effect on T2DM risk (RR 1.06; P = 0.058). Finally, high intake of plant protein did not affect T2DM risk (RR 0.93; P = 0.074), whereas moderate intake was associated with a reduced risk of T2DM (RR 0.94; P < 0.001). The results of this study indicate that high total protein and animal protein intakes are associated with an increased risk of T2DM, whereas moderate plant protein intake is associated with a decreased risk of T2DM. The online version of this article ( https://doi.org/10.1007/s00592-019-01320-x) contains supplementary material, which is available to authorized users. Type 2 diabetes mellitus (T2DM) is an important public health problem. In the USA, approximately 2.9 million individuals have diabetes and 90% of them are patients with T2DM . These patients have an increased risk of atherosclerosis, cardiovascular diseases, chronic kidney disease, and cancer, all of which can reduce the life expectancy by nearly 10 years . Many individuals have intermediate hyperglycemia, which can progress to diabetes [3, 4, 5]. Therefore, an effective preventive strategy should be explored by focusing on individual characteristics. Studies have already identified several risk factors for T2DM, such as adiposity, low hip circumference, certain serum biomarkers, unhealthy dietary patterns, low educational and conscientiousness levels, decreased physical activity, high sedentary time and duration of watching television, alcohol intake, smoking, air pollution, and several medical conditions . Several studies have focused on the association between dietary protein intake and T2DM risk, but data are limited and remain inconclusive. Short-term trial results indicated that high dietary protein intake could improve glucose homeostasis [7, 8]. Nevertheless, T2DM risk seems to depend on the type of dietary protein, as plant proteins appear to exhibit a protective effect against T2DM . One study showed that high intake of total and animal protein was associated with an increased risk of T2DM, whereas T2DM risk was reduced in individuals with high plant protein intake . Nonetheless, the effect of moderate dietary protein intake on T2DM risk has not been investigated in previous studies. Definition of an optimal intake of dietary protein to reduce the risk of T2DM is particularly important for the general population. Therefore, this study aimed to evaluate the relationship between dietary protein intake and T2DM risk based on a large-scale examination of prospective cohort studies. 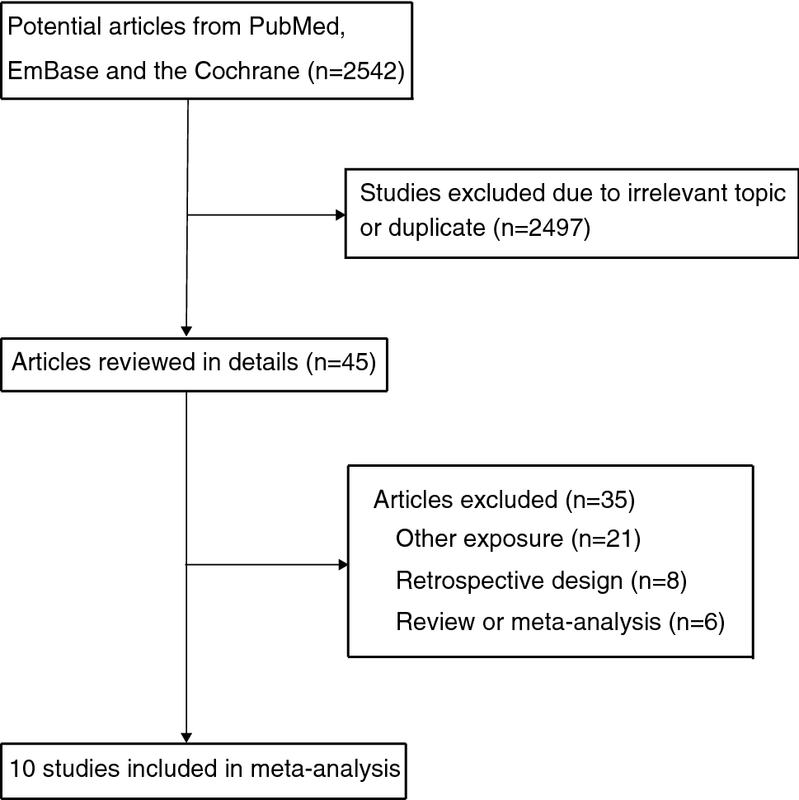 This review was conducted and reported according to the Preferred Reporting Items for Systematic Reviews and Meta-Analyses (PRISMA) Statement issued in 2009 . Prospective cohort studies investigating the association between dietary protein intake and risk of T2DM were included in our study, without restrictions of publication language and status. We systematically searched for relevant studies published until November 2018 in the PubMed, Embase, and Cochrane library databases using the following search terms: “dietary protein” OR “protein intake” OR “plant protein” OR “animal protein” OR “food” AND “diabetes” OR “diabetes mellitus” OR “T2DM” AND “prospective”. A manual search in the reference lists from relevant original and review articles was also conducted to identify further studies. The literature search and study selection were conducted by two reviewers according to a standard approach, and any disagreement was resolved by the primary author. Studies were included if they: (1) had a prospective cohort design, (2) investigated total, animal, and plant protein intakes, (3) defined T2DM incidence as the outcome, and (4) reported the effect estimates [risk ratio (RR), hazard ratio (HR), or odds ratio (OR)] and 95% confidence intervals (CIs) to compare high or moderate protein intake with the lowest protein intake relative to the risk of T2DM. Studies with a retrospective observational design, such as traditional case–control and retrospective cohort studies were excluded due to various confounding factors that could result in bias. The collected data included the first author’s name, publication year, study period, country, study cohort, sample size, number of T2DM cases, age range, percentage of male subjects, diet assessment, follow-up duration, adjusted factors, and effect estimate with corresponding 95%CIs. The effect estimate was selected as the maximally adjusted potential confounder if the study reported several multivariable adjusted effect estimates. The quality of retrieved studies was evaluated using the Newcastle-Ottawa Scale (NOS), based on the selection (4 items: 4 stars), comparability (1 item: 2 stars), and outcome (3 items: 3 stars) data . A “star system” rating the study quality ranged from 0 to 9, and studies with 8 or 9 stars were regarded as good quality. Data collection and quality assessment were carried out by two reviewers, and any inconsistencies were resolved by an additional author by referring to the original studies. The association between dietary protein intake and T2DM risk was evaluated based on the effect estimate and its 95% CI in each study. The high protein intake category was defined as the highest protein intake category in each study, and the moderate protein intake categories were pooled using a fixed-effect model if ≥ 2 categories were reported . Then, the pooled RRs with their 95% CIs were calculated using the random-effects model . I2 and Q-statistic were used to evaluate the heterogeneity among included studies, and P < 0.010 was considered significant heterogeneity . Sensitivity analyses were conducted to evaluate the stability of pooled results by excluding individual studies . Meta-regression and subgroup analyses were performed to explore the potential impact factors and evaluate the relationship between dietary protein intake and T2DM risk in patients with specific characteristics [17, 18]. Publication biases were assessed using Funnel plots, and Egger’s  and Begg’s  tests. All P values obtained for pooled results were two-sided, and P values of < 0.05 were considered statistically significant. Statistical analyses were performed using the STATA software (version 10.0; Stata Corporation, College Station, TX, USA). The electronic search identified 2542 records in PubMed, Embase, and the Cochrane library (Fig. 1). Among the identified studies, 2497 were excluded due to irrelevant topics and duplicate titles. The remaining 45 studies were retrieved for further evaluation, and 35 further studies were excluded because they reported an assessment other than dietary intake (n = 21), had a retrospective design (n = 8), or were reviews or meta-analyses (n = 6). Finally, ten prospective cohort studies that met the inclusion criteria were included in the final quantitative meta-analysis [21, 22, 23, 24, 25, 26, 27, 28, 29, 30]. The manual search of the reference list in retrieved studies did not identify any additional suitable studies. The 10 identified studies included 21 cohorts with a total of 487,956 recruited participants and 38,350 reported T2DM cases. The follow-up duration was 5–24 years, and 2,332–74,155 individuals were included from individual studies. Three studies were conducted in the USA, 4 in Europe, 2 in Australia, and 1 in Asia (Japan). The study quality was evaluated using NOS; 4 studies had nine stars, 4 had eight stars, and the remaining 2 had seven stars. Table 1 summarizes the characteristics of the included studies. A total of ten studies reported an association between high total protein intake and subsequent T2DM risk. The pooled RRs indicated that high total protein intake was associated with an increased T2DM risk (RR 1.10; 95% CI 1.03–1.17; P = 0.006; Fig. 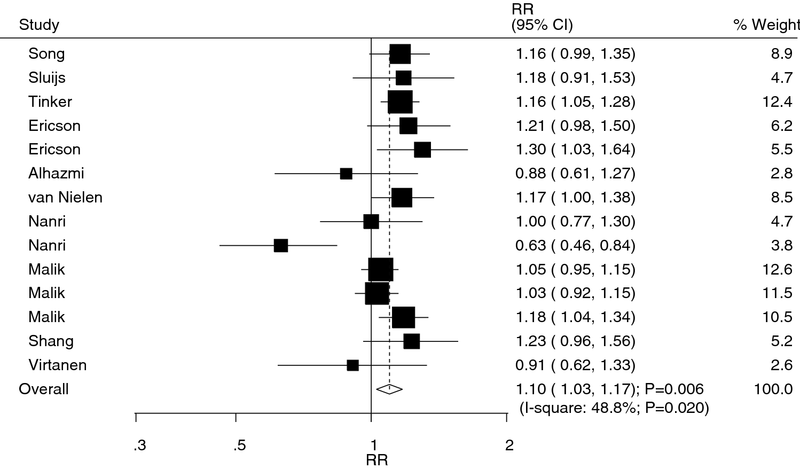 2), with significant heterogeneity across the studies (I2 48.8%; P = 0.020). The results of the sensitivity analysis indicated that the pooled results were stable and were not altered by sequentially excluding any of the studies (Supplemental file 1). Meta-regression analysis indicated that country (P = 0.014) and NOS (P = 0.002) might affect the relationship between high total protein intake and T2DM. 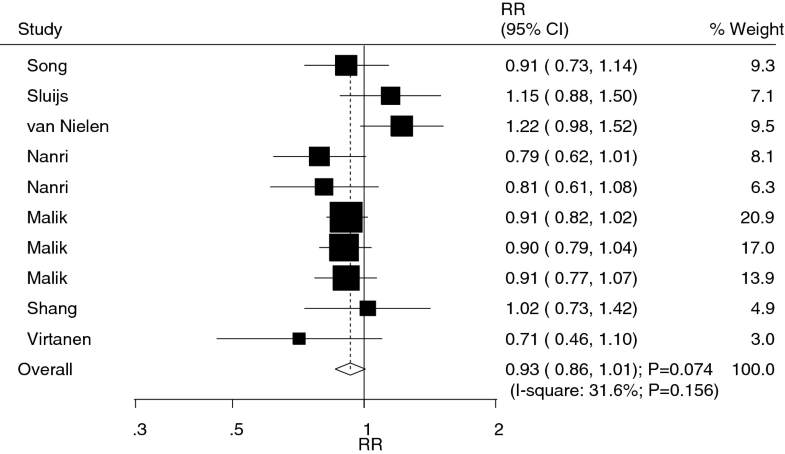 Subgroup analyses revealed that high total protein intake was significantly associated with T2DM risk in studies conducted in the USA (RR 1.11; 95% CI 1.05–1.17; P < 0.001) and Europe (RR 1.18; 95% CI 1.07–1.31; P = 0.001), in those that included men (RR 1.14; 95% CI 1.03–1.26; P = 0.008) or both men and women (RR 1.19; 95% CI 1.05–1.34; P = 0.005), in those with a follow-up duration of ≥ 10.0 years (RR 1.14; 95% CI 1.07–1.21; P < 0.001), in those not adjusted for family history of DM (RR 1.19; 95% CI 1.08–1.31; P = 0.001), and in those with a high quality (RR 1.12; 95% CI 1.07–1.17; P < 0.001, Table 2). No publication showed a significant relationship between high total protein intake and T2DM risk (P value for Egger’s test: 0.429; P value for Begg’s test: 0.274; Supplemental file 2). A total of 9 studies reported an association between moderate total protein intake and subsequent T2DM risk. No significant association was observed between moderate total protein intake and T2DM risk (RR 1.00; 95% CI 0.95–1.06; P = 0.917; Fig. 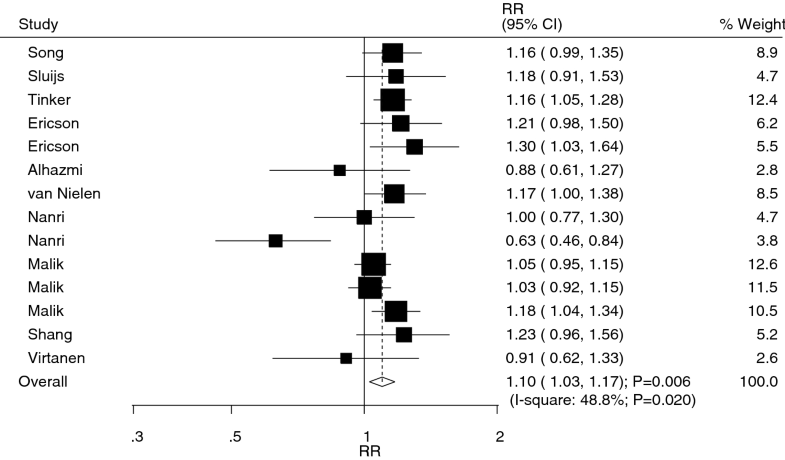 3), with a significant heterogeneity across the studies (I2 74.7%; P < 0.001). Sensitivity analysis indicated that the results remained the same after each study was sequentially excluded from the overall analysis (Supplemental file 1). The results of the meta-regression analyses indicated that gender (P = 0.047) and follow-up duration (P = 0.003) play an important role in the relationship between moderate total protein intake and T2DM risk. Subgroup analyses showed no significant associations in all subsets based on predefined factors (Table 2). No significant publication bias was observed (P value for Egger’s test: 0.891; P value for Begg’s test: 0.669; Supplemental file 2). Seven studies reported an association between high animal protein intake and elevated T2DM risk. High animal protein intake was associated with an increase in T2DM risk (RR 1.13; 95% CI 1.03–1.25; P = 0.013; Fig. 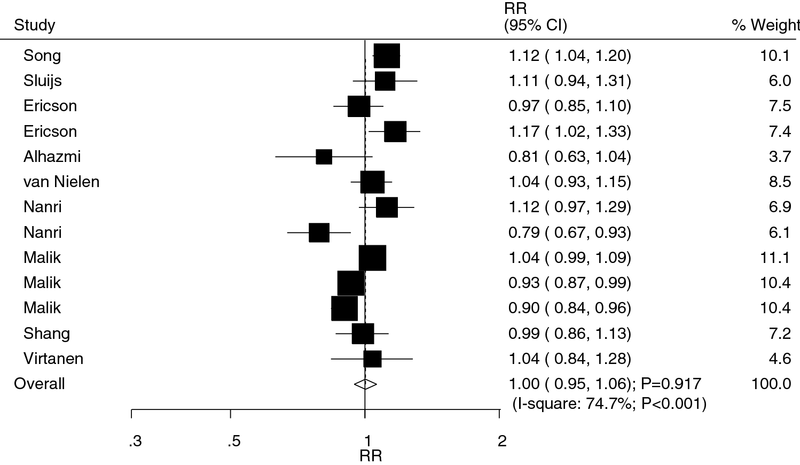 4), with significant heterogeneity among the evaluated studies (I2 64.7%; P = 0.002). The conclusion was stable and not affected by the exclusion of any specific study (Supplemental file 1). Country (P = 0.013) and NOS (P = 0.002) were significant confounders to determine the relationship between high animal protein intake and T2DM based on meta-regression analyses. Subgroup analyses indicated significant association between high animal protein intake and T2DM risk in most subsets, whereas high animal protein intake was not associated with T2DM risk when the study was conducted in Asia or Australia, included women, had a follow-up duration of < 10.0 years, was adjusted for family history of DM, or had a low quality (Table 2). The Egger’s (P = 0.721) and Begg’s (P = 0.592) test results showed no evidence of publication bias (Supplemental file 2). Seven studies reported an association between moderate animal protein intake and increased T2DM risk, but without reaching statistical significance in the pooled analysis (RR 1.06; 95% CI 1.00–1.12; P = 0.058; Fig. 5) and with significant heterogeneity among the included studies (I2 71.9%; P < 0.001). Sensitivity analyses indicated that moderate animal protein intake might play an important role in elevated T2DM risk based on the marginal 95% CI (Supplemental file 1). Meta-regression analysis revealed that no predefined factors could affect the relationship between moderate animal protein intake and T2DM risk. 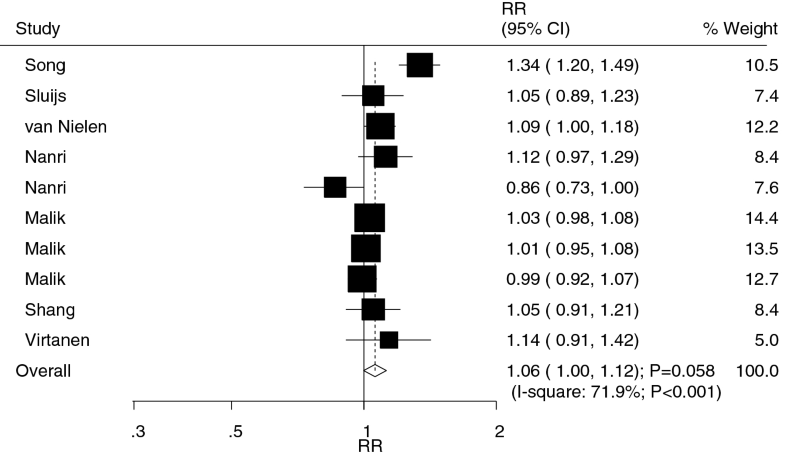 Subgroup analysis demonstrated an increased T2DM risk after moderate animal protein intake when the study was conducted in Europe (RR 1.09; 95% CI 1.01–1.19; P = 0.019), included both men and women (RR 1.07; 95% CI 1.01–1.15; P = 0.031), made no adjustment for family history of DM (RR 1.08; 95% CI 1.01–1.16; P = 0.036), and had a high quality (RR 1.07; 95% CI 1.00–1.14; P = 0.044). No evidence of publication bias was observed (P value for Egger’s test: 0.539; P value for Begg’s test: 0.858; Supplemental file 2). 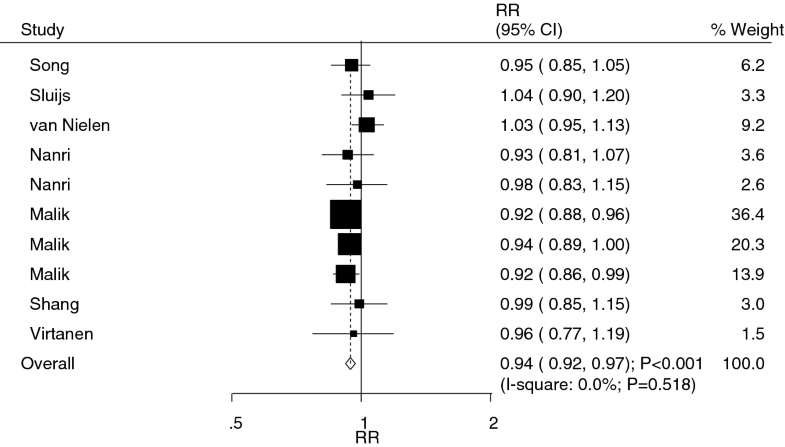 Seven of the assessed studies reported an association between high plant protein intake and subsequent T2DM risk, without reaching statistical significance in the pooled RR analysis (RR 0.93; 95% CI 0.86–1.01; P = 0.074; Fig. 6); heterogeneity among the included studies was not statistically significant (I2 31.6%; P = 0.156). Sensitivity analysis indicated that high plant protein intake might protect from T2DM progression (Supplemental file 1). Meta-regression analysis revealed that country (P = 0.040), gender (P = 0.006), adjustment for family history of DM (P = 0.012), and NOS (P = 0.041) could affect the relationship between high plant protein intake and T2DM risk. Subgroup analyses showed that high plant protein intake was associated with reduced T2DM risk when the study was conducted in Asia (RR 0.80; 95% CI 0.66–0.96; P = 0.017) or the USA (RR 0.91; 95% CI 0.84–0.97; P = 0.008), included men (RR 0.85; 95% CI 0.75–0.97; P = 0.018) or women (RR 0.90; 95% CI 0.83–0.97; P = 0.007), had a follow-up duration < 10.0 years (RR 0.88; 95% CI 0.81–0.96; P = 0.005), contained adjustments for the family history of DM (RR 0.90; 95% CI 0.84–0.96; P = 0.001), and had a low quality (RR 0.78; 95% CI 0.66–0.93; P = 0.005). No significant publication bias was observed (P value for Egger’s test: 0.918; P value for Begg’s test: 0.858; Supplemental file 2). Seven studies reported an association between moderate plant protein intake and subsequent T2DM risk. Overall, moderate plant protein intake was associated with reduced T2DM risk (RR 0.94; 95% CI 0.92–0.97; P < 0.001, without evidence of heterogeneity; Fig. 7). Sensitivity analysis indicated that the conclusion was not altered after each study was sequentially excluded from the overall analysis (Supplemental 1). Meta-regression analysis demonstrated that gender (P = 0.032) and adjustment for family history of DM (P = 0.031) affected the relationship between moderate plant protein intake and T2DM risk. Subgroup analyses indicated that this significant association was present in the study conducted in the USA (RR 0.93; 95% CI 0.90–0.96; P < 0.001), in studies that included men (RR 0.92; 95% CI 0.87–0.98; P = 0.011) or women (RR 0.93; 95% CI 0.90–0.96; P < 0.001), in studies with a follow-up duration of < 10.0 years (RR 0.93; 95% CI 0.89–0.96; P < 0.001), in studies with adjustment for family history of DM (RR 0.93; 95% CI 0.91–0.96; P < 0.001), and in studies with a high quality (RR 0.95; 95% CI 0.92–0.98; P = 0.002) (Table 2). No significant publication bias was observed (P value for Egger: 0.079; P value for Begg’s test: 0.210; Supplemental file 2). The association between specific high-protein foods and the risk of T2DM was also assessed (Table 3). High (RR 1.26; 95% CI 1.04–1.52; P = 0.016) and moderate (RR 1.11; 95% CI 1.02–1.20; P = 0.017) processed meat intake and high poultry intake (RR 1.25; 95% CI 1.03–1.52; P = 0.025) were associated with increased risk of T2DM in women. The risk of T2DM in men was significantly increased by a high intake of dairy products (RR 1.24; 95% CI 1.04–1.47; P = 0.018). Moderate fish intake was associated with a reduced risk of T2DM in men (RR 0.85; 95% CI 0.77–0.94; P = 0.002), and moderate intake of fiber-rich bread and cereals reduced the risk of T2DM in both men (RR 0.89; 95% CI 0.79–1.00) and women (RR 0.88; 95% CI 0.78–1.00; P = 0.045). Finally, no other significant association was observed for other types of high-protein foods, including red meat, eggs, soy, and refined cereals. 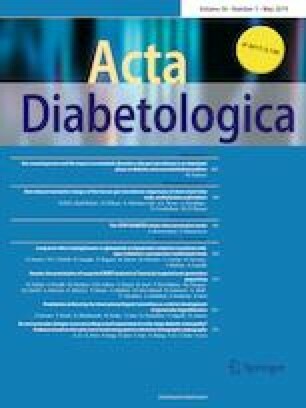 The present systematic review and meta-analysis of 21 cohort studies reported in 10 articles provide comprehensive evidence for an association between dietary protein intake and increased T2DM risk. A combined total of 487,956 individuals with various characteristics participated in these studies and 38,350 T2DM cases were reported. This study indicated that a high total protein intake was associated with an increased T2DM risk, whereas there was no effect of moderate total protein intake on T2DM risk. Moreover, a high animal protein intake increased the T2DM risk, whereas moderate intake of animal protein was not significantly associated with a risk of T2DM. Furthermore, moderate plant protein intake was linked to a reduction in T2DM risk, while no such effect was observed for high plant protein intake. In addition, the intake of processed meat, poultry, and total dairy products correlated with a greater risk of T2DM, whereas moderate intake of fish or fiber-rich bread and cereals appeared to protect from T2DM. Finally, these associations might differ according to country, gender, follow-up duration, family history of DM, and study quality. A previous meta-analysis has already illustrated the relationship between dietary protein intake and T2DM risk. The authors demonstrated that the highest total and animal protein intakes were associated with an increased T2DM risk in both men and women, whereas plant protein consumption was associated with reduced T2DM risk in women. Moreover, the T2DM risk was increased in individuals who consumed high amounts of red and processed meat, whereas high intake of soy, dairy, and dairy products protected from T2DM. In contrast, egg and fish intakes were not linked to T2DM risk . Nevertheless, the previous meta-analysis did not determine whether the relationship between dietary protein intake and T2DM differs based on individual characteristics. Moreover, we identified a significant mistake in this meta-analysis as it included the study conducted by Bao et al., which specifically evaluated the association between dietary protein intake and gestational DM risk . Although women with gestational DM have an increased risk of developing T2DM in the years following pregnancy, this study might have overestimated the association between dietary protein intake and T2DM risk . Therefore, the current study was conducted to provide an updated meta-analysis and elucidate the relationship between dietary protein intake and T2DM risk. The mechanisms behind the association of dietary protein intake with T2DM risk are not well established. The positive relationship between total protein intake and T2DM risk might reflect the predominant protein source, as most of the dietary protein consumed was derived from animal sources, particularly in the USA and Europe . Moreover, high animal protein intake is significantly correlated with high fat, low fiber, and low vitamin intakes, which can also have an impact on T2DM progression. Furthermore, amino acid metabolism plays a pivotal role in the development of metabolic disorders and could, therefore, increase the T2DM risk [33, 34]. Glycine and methionine are positively associated with T2DM risk and these amino acids are primarily obtained from animal food sources . In addition, plant protein intake inversely correlates with T2DM risk. This could be due to the high intake of fiber, magnesium, and vitamin with plant-based food sources, which could slow down T2DM progression. Moreover, the balanced amino acid composition of plant proteins has been shown to exert beneficial effects on amino acid metabolism and could diminish the risk of metabolic disorders . The results of this study indicated that the relationship between the dietary protein intake and T2DM risk differs according to country, gender, follow-up duration, adjusted family history of DM, and NOS. We propose the following reasons for this variation: (1) the source of protein intake differs between countries, and the protein intake was higher in Western countries than in Eastern countries; (2) women have a higher percentage of body fat, which could explain the differences between men and women in total and animal protein intake and associated T2DM risk [37, 38]; (3) the follow-up duration correlated with high event rates, which were associated with body weight in the overall analysis; (4) a family history of T2DM is significantly associated with diagnosis at a younger age and higher body mass index and waist circumference, which in turn may lead to complications; and (5) the study quality correlated with the evidence level, and in turn the results differed based on the study quality. This study has several strengths that should be highlighted. The results were based on a prospective cohort study, which may prevent potential selection and recall biases observed with retrospective observational studies. Moreover, all included studies had fully adjusted models, and hence the results were adjusted for the most important factors. Furthermore, this study had a large sample size, and the pooled results are more robust than those of any individual study. Finally, analyses were performed to determine whether these associations differed according to country, gender, follow-up duration, adjusted family history of DM, and study quality. The limitations of this study should be acknowledged. First, the included studies were inconsistent for the adjusted factors that may have an impact on T2DM progression. Second, the cut-off values of dietary protein intake were different across studies, which might introduce potential bias and high heterogeneity of analyzed data. Third, an analysis of the association between specific high-protein foods and the risk of T2DM stratified by country and other characteristics was not performed because only a few of the included studies reported specific high-protein foods. Fourth, we could not determine if any associations between dietary proteins and the risk of T2DM are due to interactions with other macronutrients such as fat, fiber, and vitamin, as data on these factors were not available. Fifth, publication bias was inevitable because this study is based on published studies. Finally, the studies contained no individual data and, therefore, a detailed analysis of specific characteristics of the study participants was restricted. In conclusion, high total protein intake is notably associated with an increased risk of T2DM, whereas moderate total protein intake has little or no effect on T2DM progression. Moreover, high or moderate animal protein intake might increase the T2DM risk. Conversely, plant protein intake might offer protective effects against T2DM. Further large-scale prospective studies should be conducted to verify the stratified results of this study. For this type of study formal consent is not required.